That's not a typo in the title. National Pi Day isn't referring to the sweet and savory pies we eat, but the Greek letter (π) used in mathematics to represent the numerical value of the ratio of the circumference of a circle to its diameter, approximately 3.14159.... Math is an important part of cooking -- just think of all the fractions! Since today is March 14 (3/14), I thought it would be fun to use this play on words with pie recipes I've posted in the past. Pecan Streusel Pumpkin Pie: The addition of a streusel topping takes a plain pumpkin pie from ho hum to wow! 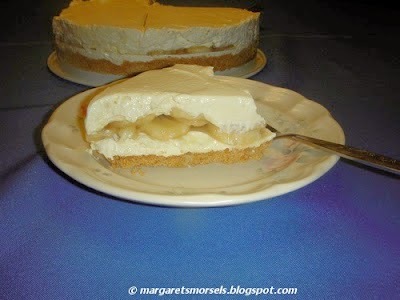 Banana Cream Supreme: This cool and creamy, no bake pie is a cross between banana pie and banana pudding. Lemonade Pie: What's more refreshing on a hot summer day than a glass of lemonade? A piece of lemonade pie! This beat the heat dessert gets its wonderful lemon flavor from a can of lemonade concentrate. Easy Peanut Butter Chip Pie: The pie is made with peanut butter chips and not peanut butter. If you love chocolate and peanut butter, top the pie with a bottle of chocolate Magic Shell topping! Chocolate Dream Pie: This no bake pie only uses four ingredients and half of them are chocolate! Chocolate Cobbler: This eggless cobbler makes its own chocolate sauce! It's best served hot from the oven with a scoop of ice cream on top! Cookie Apple Cobbler: This apple pie is super easy to make. The crust is made with a package of refrigerated sugar cookie dough! Chicken Pot Pie: The picture doesn't do this pie justice! Refrigerated pie crusts encase a filling made with canned chicken, vegetables, soup, milk and seasonings. Broccoli Quiche: You don't have to make the pie crust, cook the broccoli or, if you don't mind spending a little extra, even grate the cheese! Bacon Quiche: This quiche uses a package of refrigerated pie crusts and is baked in a 13 x 9-inch pan. The filling ingredients can be assembled and refrigerated ahead of time. From Ho Hum to Wow!